As I noted yesterday: Every year at this time, I trace the final days leading up to the first (and so far only) use of the atomic bomb against cities, Hiroshima and Nagasaki, Japan, in August 1945. In this way the fateful, and in my view, very tragic, decisions made by President Truman and his advisers, and the actions of scientists in Los Alamos, and others, can be judged more clearly in "real time." This is a subject that I have studied and written about in hundreds of articles and three books (including Atomic Cover-up) since the early 1980s with a special emphasis on the aftermath of the bombings, and the government and media suppression in the decades after. Now, today's entry, going back to July 18-19, 1945. Read yesterday's entry for more on Truman's view of how Russia's entry in war would mean "fini Japs." "P.M. [Churchil] & I ate alone. Discussed Manhattan (it is a success). Decided to tell Stalin about it. Stalin had told P.M. of telegram from Jap Emperor asking for peace. Stalin also read his answer to me. It was satisfactory. Believe the Japs will fold up before Russia comes in. I am sure they will when Manhattan [reference to Manhattan Project] appears over their homeland. I shall inform about it at an opportune time." So there is a "telegram from Jap Emperor asking for peace." Of course, we'll never know if peace could have been worked out shortly. One alleged hang-up was that the U.S. was demanding "conditional surrender" while the Japanese wanted to be able to keep their emperor as a figurehead. Of course, after we dropped the bomb, we allowed this condition. This, and Truman's view that the Soviet entry into the war, set for around August 8, would provoke a surrender made it vital for him--in the view of some historians--to use the new weapon as soon as possible. Truman also wrote a letter to his wife Bess, affirming his belief that the Soviet declaration of war--even without the Bomb--would cause an end to the war well before the planned U.S. invasion. I've gotten what I came for - Stalin goes to war August 15 with no strings on it... I'll say that we'll end the war a year sooner now, and think of the kids who won't be killed! That is the important thing. 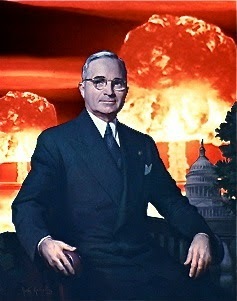 Truman would use the new weapon anyway, killing at least 50,000 Japanese "kids."